SUP ATX Journey Inflatable iSUP PAK | Color: Seafoam | Length: 10'6"
The 10’6” SUP ATX Inflatable iSUP PAK was designed with functionality, comfort, and convenience in mind. The SUP ATX inflatable board is built with an extremely rigid drop-stitch design and a removable center fin that provides consistent tracking. The overall shape makes for a stable inflatable, and the large EVA footpad provides excellent grip and comfort. The SUP ATX inflatable package also includes a 3- piece aluminum adjustable paddle, high-pressure spring valve, stainless D-rings for securing small cargo, a convenient carrying handle, a high pressure double action pump, and a handy backpack carrying case. The perfect board to get out and paddle anywhere on Earth! FREE SHIPPING in 48 Continental US States! 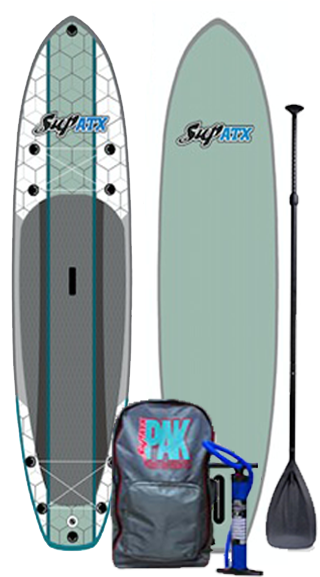 The 10’6” SUP ATX Inflatable iSUP PAK was designed with functionality, comfort, and convenience in mind. The SUP ATX inflatable board is built with an extremely rigid drop-stitch design, using MSL Technology, and a removable center fin that provides consistent tracking. The overall shape makes for a stable inflatable, and the large EVA footpad provides excellent grip and comfort. The SUP ATX inflatable package also includes a 3- piece aluminum adjustable paddle, high-pressure spring valve, stainless D-rings for securing small cargo, a convenient carrying handle, a high pressure double action pump, and a handy backpack carrying case. The perfect board to get out and paddle anywhere on Earth! Packages are in stock for same-day Free Shipping within the 48 Continental US States!